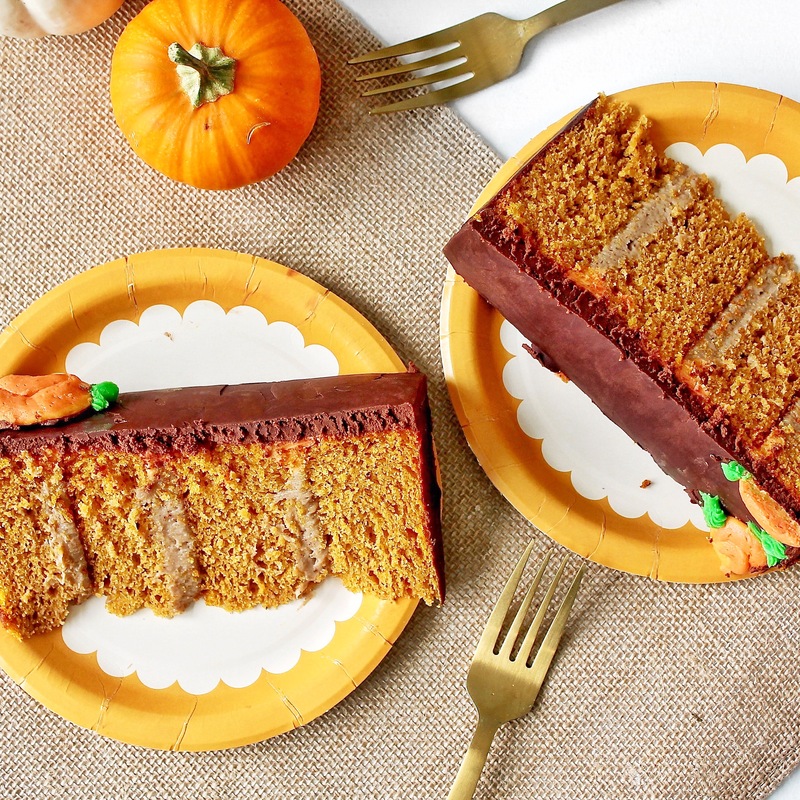 Tender pumpkin spice cake layers, filled with a maple cinnamon cheesecake filling and coated with a dark chocolate ganache. 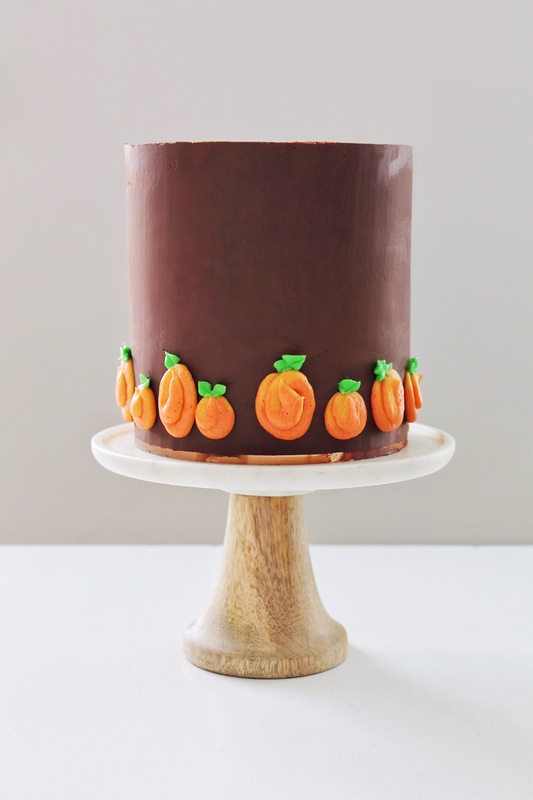 It’s officially Fall and there’s no better way to start the new season than with a new cake! 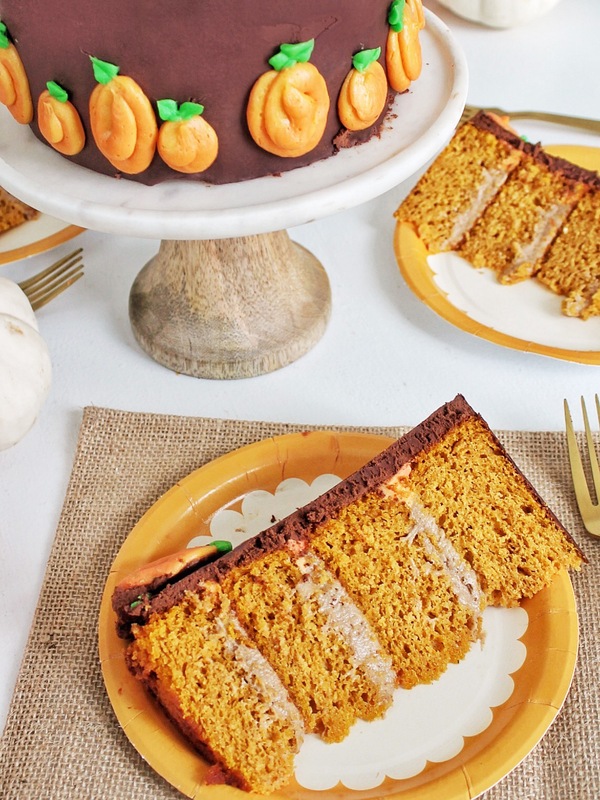 This pumpkin cake with maple cinnamon cheesecake and chocolate ganache is a new twist on a pumpkin cake I did a couple years ago. When I first made this cake, I did a chocolate ganache filling and a maple cream cheese frosting. I loved it so much back then that I thought I’d bring it back, but with a twist! In the first version of this cake, the maple cream cheese frosting was pretty sweet. A little too sweet when paired with the sweetness of the cake and richness of the ganache. This time around, I thought I’d tone down the sweetness and add a new flavor element. 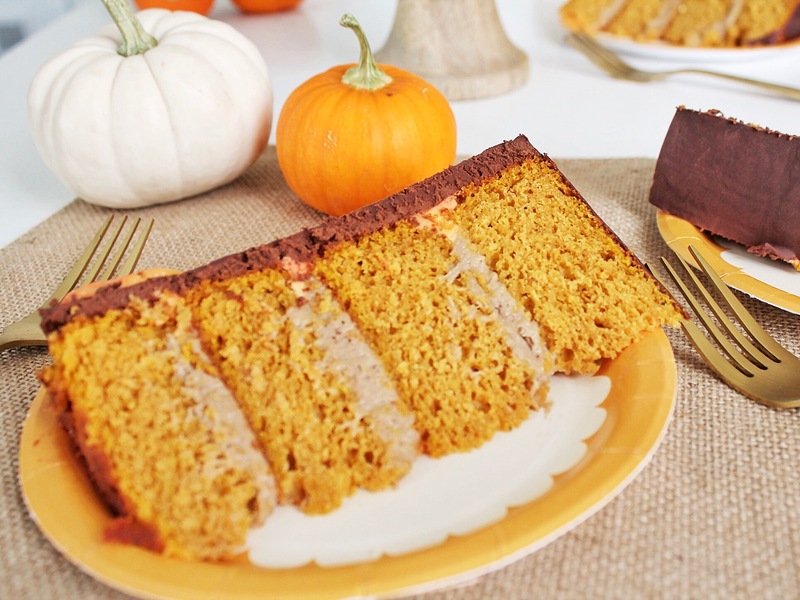 The maple cinnamon cheesecake filling gives the cake a little sour taste, which balances so nicely with the sweet cake and bitter dark chocolate. The cake itself is adapted from Sweetapolita. It’s so tender and flavorful. In fact, let this be your warning: you’ll likely eat it all on its own before even getting to the filling and ganache. It’s just that good! For the ganache, I recommend using a dark chocolate but you can also use semi-sweet. Just don’t use milk chocolate, it will be too sweet and I don’t think pairs as well with the cake and filling. And finally, for the filling, feel free to make that ahead of time and give it some time to set in the refrigerator. It will still spread nicely but will be more stable if you give it some chill time. 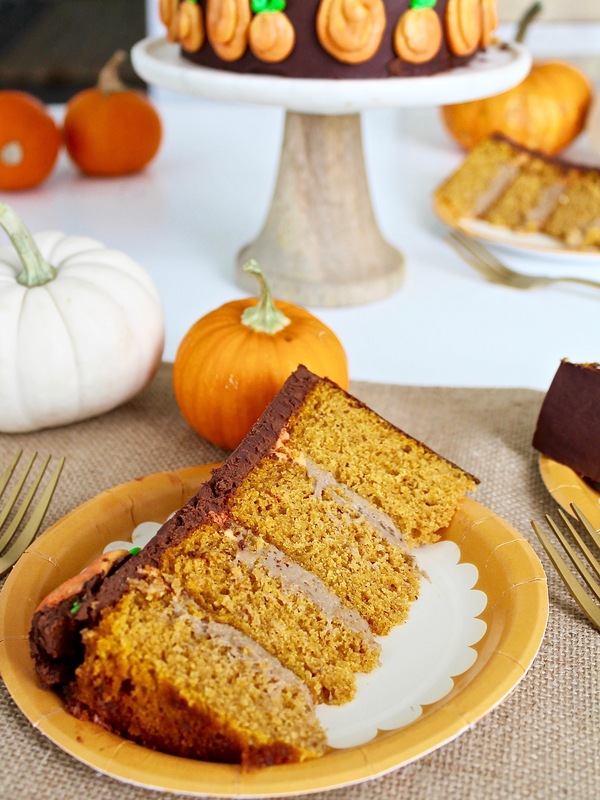 Tender pumpkin spice cake layers with maple cinnamon cheesecake filling and chocolate ganache frosting. Preheat 350 degrees F. Spray four 6-inch pans or three 8-inch round cake pans with cooking spray and line the bottoms with parchment paper rounds. Spray again and then set aside. In the bowl of an electric mixer fitted with the paddle attachment, beat the sugar and eggs together on medium-high speed until light and fluffy, about 5 minutes. Add the oil and vanilla and beat on medium until combined, about 30 seconds. Add the pumpkin puree and mix until combined, about another 30 seconds. Evenly distribute batter into the prepared pans, smooth with a small offset palette knife and place in the center of the middle rack of the oven, about 2 inches apart. Bake until a knife or toothpick inserted into the center comes out clean, about 23 to 25 minutes. Preheat your oven to 320 degree F. Line the bottom and sides of a 6x6 inch baking pan with plastic wrap. Set aside. In the bowl of a stand mixer fitted with the paddle attachment, beat the cream cheese on low speed for 2 minutes. Add the sugar and mix for 1 to 2 minutes, until the sugar has been completely incorporated. Scrape down the sides of the bowl and mix for another 30 seconds. In a small bowl, whisk the cornstarch and salt. Whisk in the milk, in a slow, steady stream, then whisk in the egg until the slurry is homogenous. With the mixer on medium-low, stream in the egg slurry. Mix for about 3 to 4 minutes, until the mixture is smooth and loose. Scrape down the sides of the bowl. Add the maple flavor and cinnamon. Mix until combined. Pour the cheesecake batter into the pan, put the pan in the oven and bake for 25 minutes. When the time is up, gently shake the pan. The cheesecake should be firmer and more set toward the outer edge but still jiggly and loose in the center. If the cheesecake is jiggly all over, give it another 5 minutes. Cool the cheesecake completely to finish the baking process and allow the cheesecake to set. The final product will resemble cheesecake but will be spreadable. Once cooled, the cheesecake can be stored in an airtight container in the fridge for up to one week. In a microwave safe bowl, heat the cream for about 1 minute. Pour the cream over the chocolate and let sit for about 5 minutes. Mix the chocolate and cream until smooth and shiny. If needed, microwave the mixture for an additional 30 seconds. In a bowl of a stand mixer fitted with a paddle attachment, pour in the chocolate ganache and beat on medium-high for about 5 minutes. Refrigerate the ganache until slightly cooled, but not hard. You can make it ahead of time, but will need to return to room temperature and whip again before frosting. If you do this, you may need to add some more cream to make it spreadable. Make sure each cake layer is level, and the place the first cake layer on a cake board on top of a turn table. Pipe a rim of chocolate ganache around the edge of the cake layer. Fill the center of the cake with about one-third of the filling for the 6-inch cake or about one-half of the filling for the 8-inch cake. Repeat step two for the remaining cake layers. Place the final cake layer on the last layer of filling top side down. Apply a thin coat of chocolate ganache around the cake to lock in the crumbs. Freeze the cake for 10 minutes to set the frosting. Finish frosting the cake with the remaining chocolate ganache. How do you normally measure the chocolate? I usually weigh it but you don’t list the amount in a weight. Do you just measure it in measuring cups after chopping it up? Looks insanely good! I hope we make this cake in the class I am coming to! For the cheese cake center, the recipe says to put plastic wrap into the oven. You can’t put plastic wrap in the oven can you? I just need reassurance. I know it totally sounds crazy but it’s ok. It’s low heat so it won’t melt. You can also spray your pan instead. It’s a recipe adapted from Milk Bar’s recipe and they do the same thing. I just measured chips in a measuring cup. You can weigh it too. About 16 ounces of chocolate and 8 ounces of heavy cream. Umm yeah, I just pulled my cheesecake mixture out of the over and the plastic wrap was totally melted all over the food. Boo!!! Shoot! I’m so sorry to hear that happened. I haven’t had the problem before and I haven’t heard it from others yet either. I wonder if your oven runs a little warm. The idea comes from Milk Bar, a bakery I love in New York. At the low temp, it shouldn’t melt into the cheesecake filling. If you try it again, just spray your pan really well with nonstick spray.